This year is rolling on by, it's September and Christmas is right around the corner. In July, we participated in the $100 Room Challenge where we renovated the master half bath. And we got so much love from it that we decided to participate in another season! If you haven't heard, Erin from Lemons, Lavender, and Laundry started this challenge as a way to encourage people to improve their rooms, even if it's only a little at a time. We post every Wednesday in September and do the big reveal on the last week. 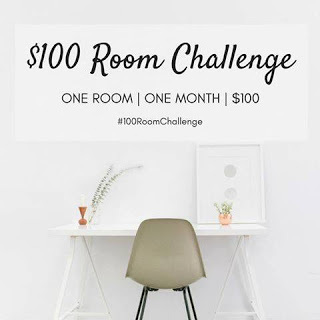 You can read more about how she started this challenge on her blog and keep up with it on social media with #100RoomChallenge. So what room are you renovating this time? Well, I debated HARD on that question. The full bathroom really needed a paint job and some storage options, and it would probably get more clicks than the second option - the carport. But at the end of the day, I want to pick what would make the biggest impact in our home and that means picking the carport. There is room for one car underneath the original house roof, but when we bought the house it came with a nice, big metal carport, leaving us with 2 nicely covered spots. As you pull up to those spots though, now that's a different and much uglier story. Right now there is a square patch of grass in between the two concrete driveways where the gutter downpipe runs filled with weeds and rocks. We can't plant anything there because of the drain pipe and any plants would get flooded. My plan right now is to clear it out and fill it with landscaping pebbles. Then we can DIY a large planter so we can plant some pretty flowers that won't get drowned by the rain. The other thing to tackle is the original rod iron columns. I might have kept them and just repainted, but before we owned it someone backed up into the corner column and ripped out all of the pretty iron work. You can still see the original pattern on the inner column. Now that painting them is out of the question, my plan is to wrap them in wood planks and stain it with a natural wood grain. That'll make them a little more bulky and ground this side of the house more. The last thing on the list is to paint over the gray gutter and eaves, but that is last on the list since it will require a few gallons of paint - so that may or may not get done this round. And also can we pressure wash the metal carport please?? Geez Elizabeth, just get it done. We've already re-painted the door black, but need to do it again. It's peeling and has been scratched, so I'm thinking we can use the same paint we put on the bottom kitchen cabinets and save some money there. This is going to be a quick 3 weeks, but I can't wait to pull up to my house and it feel a little less grungy. Stay tuned every Wednesday to see the progress and make sure to check out the other participant through the links below! Adding stone to the grass area will improve drainage issues too, if you have them! Can't wait to see how this turns out! Thanks Emy! Yep, I'm on the hunt for some pretty landscaping stones, so we'll see how it turns out! I can not wait to see your finished carport!! I need to declutter mine!! Thanks so much Sheena! I can't wait either haha. I'm glad you chose to do the space that will make the most difference for your home. Can't wait to see what you do! Aw thanks Carrie, that makes me feel better! Thank you! Thanks Morgan! The columns are probably what I'm most excited about. I don't personally have a carport but there's a lot of houses around mine that do. So I can't wait to see the final result! Thanks Natalie! This is the first one I've ever had so we'll see how it turns out. I cannot wait to see your update! I love outdoor projects and I'm so excited to see what you do with those iron columns and the wood! Good luck and I'll be following along! And I just saw that you're in Atlanta! I'm right down the road from you near Athens!! Thanks so much Melissa! I knew I had to do an outdoor project because it's starting to get cold haha. And that's awesome, we're just a bit north of Atlanta! I think that having wood columns is going to look amazing! I can't wait to see it!!! Thanks Wendy! I have this picture in my head of how good it'll look so I hope it turns out the way I want it to haha. Thanks! What a great idea, to do an outdoor space! I can't wait to see what you do with it! Thanks Meredith! I was really unsure if outdoor would be a good idea for this challenge but I'm so glad I settled on it because it'll be the last time I can do anything outside until next spring. Thanks! It's going to look great! Can't wait to watch it come together! Ahh thanks Amanda! I can't wait either haha. Love your idea for dealing with the iron columns - very creative! Thanks Lindsay! Let's just hope it turns out as good as I think it will in my head haha. Thanks Deneen! I know, we're actually in the path now for next week so I'm gonna try to get as much done today and tomorrow as I can. Stay safe! Hi! I just joined this challenge and I cannot wait to see the progress of your carport renovation!